So I’ve taken your photographs and you’re itching to see the photos. I spend a lot of time on each individual image making sure both you and your baby look your best, turning a simple photograph into a truly beautiful image. So I spend a lot of time working on your photographs and I hope this shows in my work. I hope that you appreciate that I’m working as fast as I can to get your images into your gallery. Trust me I’m as excited as you are to see the finished results. Newborns often appear more red than they actually are under studio lights so I always make sure any red from the lights as well as any dry skin, milk spots and jaundice are removed from your images as these are things that are so very temporary and will soon disappear. If you’d like to read my blog post about newborn retouching you can do so here! A private ordering session usually takes place 2-3 weeks after your photo shoot. During the ordering appointment you will view a slideshow of all the image set to music and I will be there to answer any questions you may have throughout the selection process. You will be able to touch and feel the products as well as see realistic mockups of what the images will look like on the walls of your very own home. This is an incredible opportunity to decorate the home you love with images of the people you love most in the world. 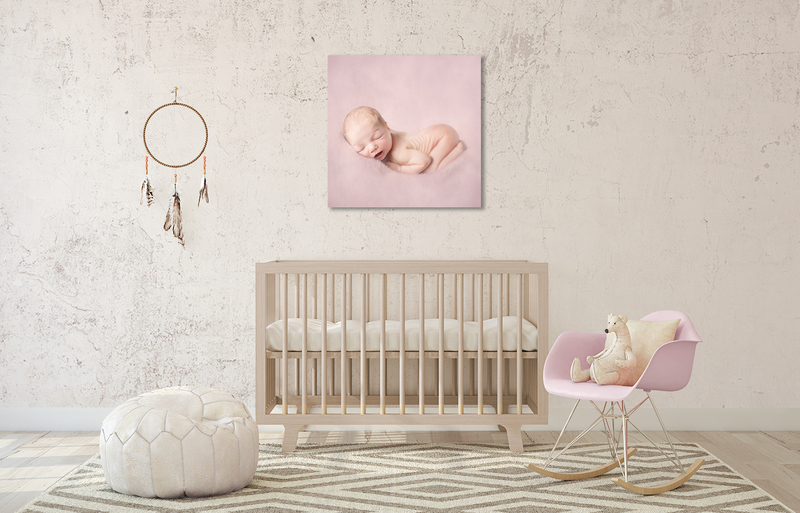 I am experienced in the area of photographic wall design and I love nothing more than to help you choose the perfect portrait(s) to fit in your space. It’s completely up to you what you choose as your forever keepsake. You have the option of purchasing both the digital images (that you can print yourself) and some magnificent products that are sourced from the best professional photographic suppliers from around the UK. Excellent quality, printed keep sakes that are only available to photographers and therefore cannot be found on the high street. Choosing your images can be overwhelming and I’m here to help you select the best images for your home. But that doesn’t mean a big sales pitch! I can’t stand pushy salesmen, so I can promise that you will only leave purchasing items you are truly wanting to buy. You will be given my full product guide including prices as soon as you inquire, once you have made your booking at also at the end of your photoshoot. So there are no hidden costs or big sales pushes. The appointment is simply there to enjoy the big reveal of your portraits and then decide which images you want to keep, and have a look over different product samples in person so you can decide after seeing, touching and feeling prints and frames in real life which ones if any you would like to order. If you’re on a budget I can present different options to suit that budget and if you’re looking for something that will specifically fit into a space in your home then you can send me a photograph of your room and I will provide you with mock-ups shown to scale of how artwork will look in that space. I am simply there for you to ask questions so you can get the most out of your images. Orders will be taken and processed at the end of the View & Order Appointment before you leave. Both credit and debit cards are accepted. You get to see what your images look like printed via a colour correct professional lab. Many high street printers produce truly awful colour accuracy in their prints. I’d hate for you to get your images printed and think it was the standard of my images that were the reason for substandard prints. If you wish to purchase digitals and print them yourself then this is completely fine and you are more than welcome to purchase the digital images for this reason. I would just like you to see how they should look before you get them printed so you know how they should be when you get them back from the lab. If you have any questions about your view and order appointment please do get in touch. If you purchase digital images only, please get them printed so you don’t forget about them in a drawer. I have so many friends who still have wedding photographs sat on a USB in a drawer somewhere still with the intention of creating an album or getting some framed. These moments are some of the happiest in your life, treasure them and show them off, and find a way of having a daily reminder of how wonderful a time it was.